Unlike the clear blue cartoon waters seen in the music video, the answer is actually pretty murky. The simple answer is that the song, released in 2015 by South Korean educational company Pinkfong, is incredibly catchy, and the lyrics and dance moves are easy to memorize. In the years since, the track went global, peaking at No. 32 on the Billboard Hot 100 on January 12 after billions of YouTube plays, streams, and downloads. The twist, however, is that thousands of adults already knew the song from their childhoods, though in most cases the version they remember probably involved eating swimmers’ legs or being reincarnated with some help from Jesus. For starters, here’s what we know about who originally wrote the song: absolutely nothing. Nobody has claimed ownership of the lyrics, and the only evidence of its longevity is the foggy memories of adults who learned the tune at summer camps, Christian youth groups, and anywhere else someone needed to keep kids occupied. Perhaps it was an imaginative counselor who saw Jaws and decided it was the perfect subject matter — after all, kids already know the horrors of “Rock-a-Bye Baby” and all the Disney movies that begin with a dead parent or two, so what’s wrong with a shark family having its dinner? Like Brothers Grimm tales, folk songs, and classic jokes, “Baby Shark” is part of an oral tradition, believed to have started as a campfire song that was never put to paper, just passed down for new generations to put their own twists on it. As children’s entertainer Johnny Only points out, “Baby Shark” likely developed from a chant, which differs from a traditional song in that it doesn’t require instruments or musical talent, so all the kids can participate. Another take on it, uploaded in 2011, comes from family entertainer Jester Jim Maurer and includes the Bible bent of “going to see Jesus” after the lifeguard on duty’s failed attempts at reviving the doomed swimmer with CPR. “I learned it at church camp in 1999, my junior year of high school. It was taught by a seminarian there while we were waiting for lunch,” he says. “I then became a youth director and taught the songs to teen groups at conferences. One of the teens had messaged me asking me how to sing the song, so I made that video back in 2011 to teach the lyrics.” Other religious versions include “praising God” and “going to heaven,” and even one about the swimmer being reincarnated as the baby shark. To add another twist to the “Baby Shark” saga, the song somehow made its way over to Europe, with the same general plot and choreography. In 2007, it became a dance hit in Germany thanks to Alexandra Müller, whose a cappella rendition, “Kleiner Hai,” came replete with the screams of the devoured swimmer and went viral. The music label EMI bought the rights to her performance and remixed it with Jaws-like music, making it a hit around the continent. The existence of “Kleiner Hai” and its publishing history was unbeknownst to Pinkfong and Only, who recorded and copyrighted his own rendition in 2011, until the former’s version blew up. SmartStudy, the company that owns Pinkfong, is certainly enjoying the phenomenon, with singing “Baby Shark” toys selling out on Amazon almost immediately before the holidays. 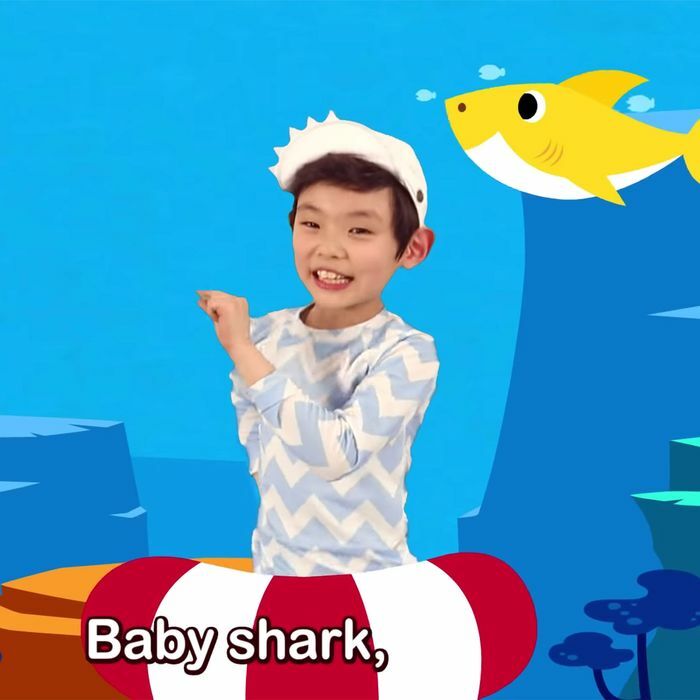 Only, however, claims that the Pinkfong version lifted too much from his rendition, “Baby Shark (Non-Dismemberment Version),” and therefore he deserves a bite of the profits. While the case is still going through motions in court, copyright attorney and USC professor Corey Field says that, in the United States, a claim like that could be valid. In short, a judge will hear from lawyers and experts who microscopically pore over the minutiae, such as the notes, BPM, lyrics, and any other musical flourishes, then proceed to a jury trial if there’s enough evidence to say the claim has merit. The only definitive way that SmartStudy, Only, and anyone else who’s made money off of “Baby Shark” is if the true author comes forward with proof, whether it’s a video or lyric sheet that can be verified as coming before any other copyright. “I know there’s some poor old songsmith out there who just has no idea,” says Vigeant, laughing. Until then, we’ll have to be content not knowing who dreamed up this juggernaut of an earworm. But at least we know that anybody can find an old song of unknown origin and create their own “Baby Shark,” provided they have the right combination of talent, social-media savvy, and the foresight to write it down or record it first. The ability to stomach repeated refrains of “doo doo doo doo doo doo” helps, too.